VERTEX ANTENNENTECHNIK (VA) designs, fabricates and supplies high precision drive and control systems, and with close cooperation between RF, mechanical and electrical/electronical engineers VA is able to provide excellent performance of the overall antenna/telescope. VA delivers complete servo & drive systems together with VA's antennas/telescopes or as stand-alone packages for upgrades/retrofits. Inplant testing is performed on a purpose built test stand in VA's integration hall. Stabilized platforms antennas/telescopes with pointing accuracies in the order of milli-degrees/arcsec can be equipped with additional subsystems such as metrology systems and/or pointing calibration systems. Is a state-of-the-art controller for Limited Motion Antennas. It has been particularly designed for antennas tracking stable or inclined GEO targets. Typical tasks are controlling of operating modes, operator interface locally at ACU or remote control from host computer and time synchronisation via NTP, PTP (option). The ACU 6000 represents the central part of a complete servo system, which also includes high quality power and interlock electronics. 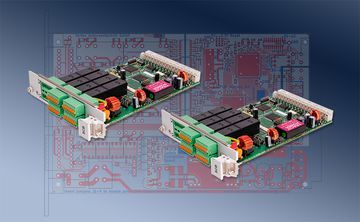 It can be supplied as part of a fully integrated servo system by VA or retrofitted into an existing servo system to provide enhanced performance and/or operational capabilities. The servo system includes the ACU 6000, an outdoor Antenna Drive Unit (ADU), transducer, motors, cables and a Portable Control Unit (PCU). Various operating modes can be implemented; for tracking the following modes are available: Program track (based on e.g. Intelsat Two Line Elements), monopulse, step-track, Orbit prediction tracking.